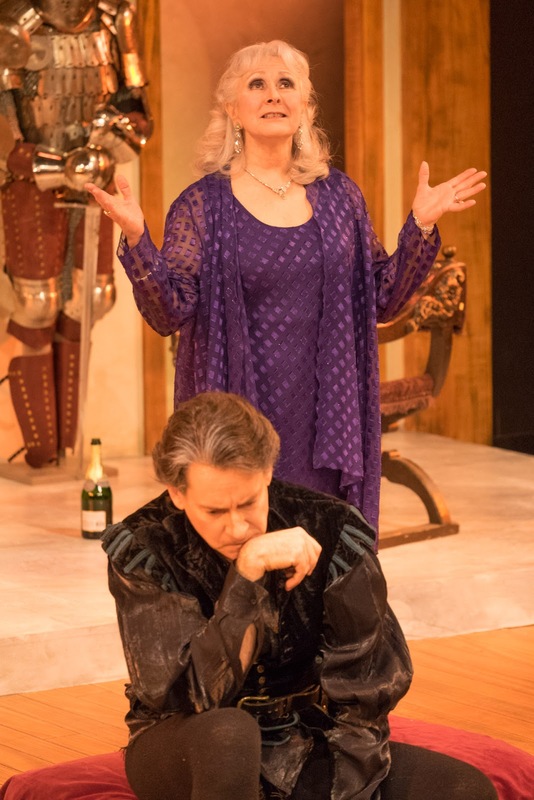 The play is superficially focused on the career of Andrew, who is both new to the city and to an apartment previously owned by a famed Hamlet actOR. John Barrymore’s ghost does not hesitate to appear when summoned by a frivolous séance led by Andrew’s real estate agent, Felicia. 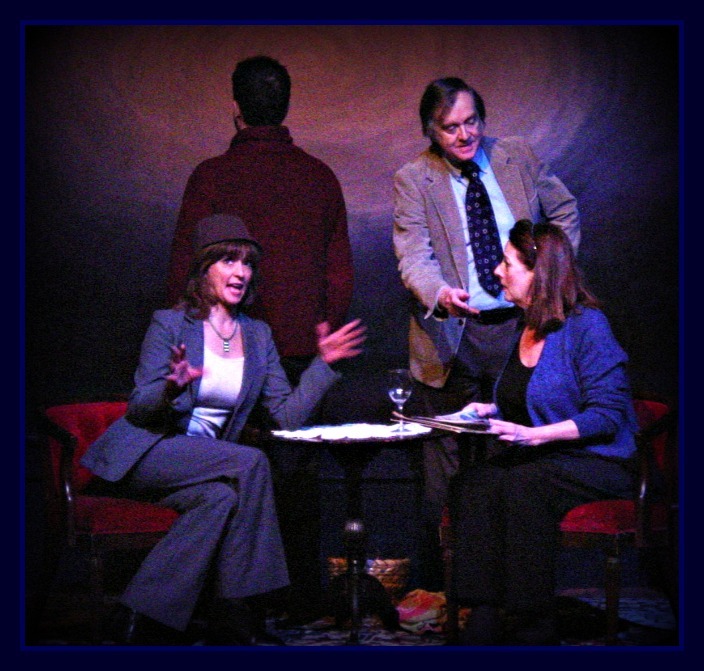 Outrageously garbed and speaking with exaggerated Brooklyn style, Julia Hochner does a fine comedic job in the role. Ownership of the stage (and the entire play), however, goes to Ezra Barnes as Barrymore. His interpretation is perfection – just grand and sweeping enough, with the right amount of schmaltz or tender sensitivity when needed, as he expounds on his life and its failures, his acting, the craft, the stage, and on art itself. It is a role that could make a buffoon of the Barrymore ghost character; Barnes saves that from happening. He is so appealing that some audience members would be happy to watch him just pushing a cart down a grocery store aisle. Barnes gets serious competition, however, from David Lanson (as Andrew’s Hollywood-style pal) who even received spontaneous applause after his appearance in Act I – this actor knows how to build a character quickly. 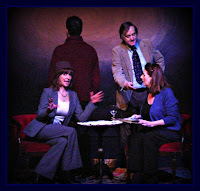 As Andrew’s fiancé Deirdre, Susan Slotoroff is engaging and almost always in motion, sometimes distractingly so. The set is a bit confusing: draping is overdone, the table is mundane, and if Andy likes modern, why did he decorate in Victorian style? Some reflectors on the white lamps might help to reduce the brightness shining into eyes on the far side of the theatre. “I Hate Hamlet” is a well-written play by an expert playwright; direction in this production is tight with taut pacing. This presentation goes down as another success by Playhouse on Park. The celebration of the music of “Ol' Blue Eyes” was a huge success. Sharp dressed vocalist Steve Lippia treated a fun audience to the music of Frank Sinatra, under the direction of guest conductor Steve Sigmund. A dramatic instrumental overture of Sinatra classics set the mood. The prelude of strings, woodwinds, and horn section built a triad of sound to create a relaxed ambiance, bringing forth Lippia in fine form for "All or Nothing at All." The Springfield Symphony Orchestra was up to the task of accompaniment for "I'll Be Seeing You" and "I'll Never Smile Again." "Without A Song" had a galvanic effect as the horn section gave it a blast. Lippia possessed a smooth flow and cool mannerism while sharing interesting tidbits of information about Sinatra along the way. His deep baritone commanded mightily on "One For My Baby", while the genteel piano of Jeff Holmes played an enlivening compliment. A beautiful rendition of "Old Man River" showcased the string section, producing a swelling, layered effect of string sound, staggered in succession. Nice job! Act 2 began with the familiar "I've Got You Under My Skin,” featuring a crescendo of stringed gusto. The audience swooned to "Summer Wind" and "Strangers In The Night" due to Lippia's spot on vocals. The moody "Softly As I Leave You" delivered a harmonic connection. Shifting sounds, the horn section hit hard in the middle portion of "Fly Me To The Moon", as the woodwinds and percussion competed to show their stuff. A suave treatment of Billy Joel's masterpiece "Just the Way You Are" was met with approval, highlighting nice changes in tempo and timbre. Conductor Sigmund conjured up perfectly timed horn blasts for "Luck Be A Lady" to noticeable audience satisfaction. The obligatory "My Way" was alive with Sinatra magic while a robust "New York, New York" made for a light, playful finale. What better way to mark the belated arrival of winter in the Valley than with a concert of Scandinavian music? For the third classical program of the season, SSO Music Director Kevin Rhodes selected two familiar masterpieces, and one that should be better known, by three composers from Finland, Norway, and Denmark. Sibelius’ patriotic tone poem “Finlandia” was a rousing opener in the orchestra’s dramatic performance, tense at the foreboding start, warm in the central hymn-like theme, and thrilling in the triumphant conclusion. The brasses were firm and blazing, while shimmering strings and delicate woodwinds provided sonic and emotional contrast. Rising American pianist Claire Huangci was featured next in a dazzling account of Grieg’s Piano Concerto in A minor. Her technical finesse and interpretive depth made this repertory staple sound new again. From the thunderous power of the opening Allegro, to the glowing hush of the tender Adagio, and the romping energy of the folk like finale, Huangci was in total control. Her greater maturity since her SSO debut in Chopin’s F minor concerto at age 18 in 2008 was impressively evident. The orchestra were equal partners in bringing Grieg’s wide palette of instrumental colors to life. Huangci’s chops were even clearer in her finger-busting encore of Turkish pianist Fazil Say’s jazzy take on Mozart’s Turkish March. Intermission was followed by a visceral rendition (the SSO’s first) of Nielsen’s rarely heard third symphony. Called “Sinfonia Espansiva” after the “Allegro espansiva” tempo marking of its first movement, the entire piece radiates the zest for life also suggested by its nickname. The vigor of the opening movement, the languor of the pastoral Andante, the gentle humor of the Allegretto, and the high spirits of the finale were all delivered with polish and conviction by Rhodes and his players. The Andante ends with a wordless vocal passage for soprano and baritone, rapturously sung by Dana Lynne Varga and John Salvi, whose voices blended magically with the orchestral instruments. By evening’s end, the goal stated in the Maestro’s program book “Reflections” to highlight the distinctive individual sounds of three Nordic composers was abundantly achieved. Playhouse on Park presents a serious play about growth with “The Chosen.” It takes place in Brooklyn in the late 1940’s. The themes are many: parental love and filial devotion, emerging identity and community, and friendship and its many tests. But perhaps the theme that emerges most sharply, and which has the most immediate relevance, is stereotyping – reacting to surface appearance instead of looking beyond it. Two boys, both Jewish, overcome their own stereotypes about each other to form a lasting bond. “The Chosen” is a wordy play, but the dialog reaches the essence of this growth. Reuven is the son of David Malter, a thoughtful, talkative liberal Jewish scholar – we see their love and mutual support. Danny is the son of Reb Saunders, a stern Hasidic leader, who has chosen near-total silence as his best approach to parenting. Can these two opposites both have positive outcomes? Can there be truth in two conflicting statements from God? And can both ways of being a Jew not only co-exist but be true to the Talmud upon which they are each based? Danny and Reuven’s friendship helps them grow away from home ties and toward independence and self-definition, even as it is tested and distorted by the emerging truths of the Holocaust and by their fathers’ conflicting positions on Zionism. The minimal set gives a distracting prominence to the center-stage entrances and exits. The script demands a lot of the five actor cast; each of the men more than measured up. One might be permitted to wonder, however, what the girls and women were doing in these communities in mid-century Brooklyn. 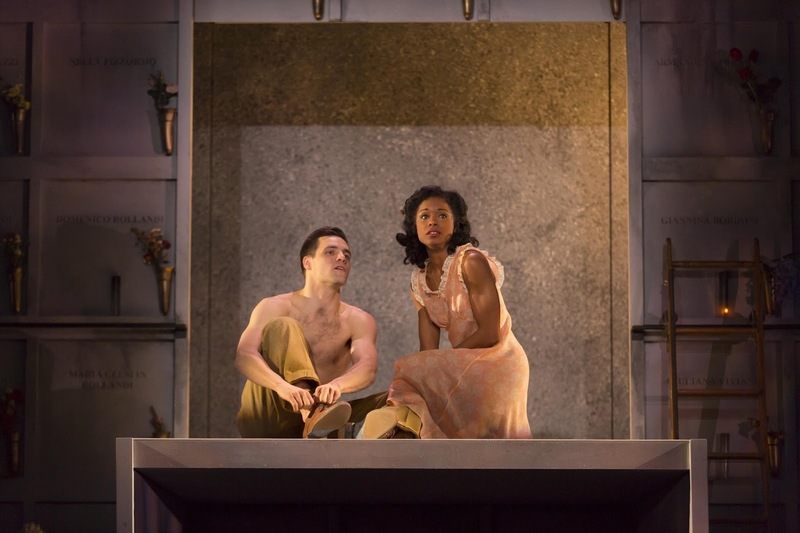 Playhouse on Park opened this play to a sold-out and enthusiastic audience, some of whom exhibited their own Talmudic knowledge in their reactions. But the play appeals to anyone who can think about his or her own stereotypical thinking enough to overcome it, learn and grow.